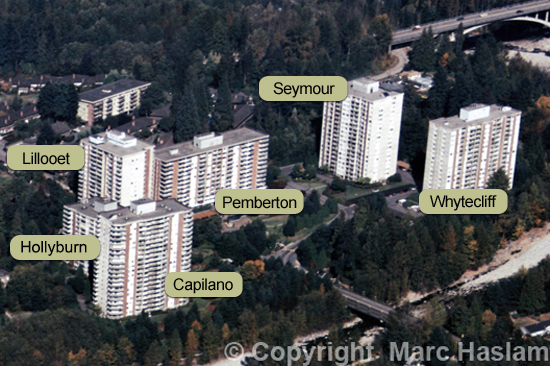 The Woodcroft Estates complex is located in North Vancouver’s lower Capilano neighbourhood on the bank of the Capilano River. Constructed in the 1970’s by Daon Development Corporation, this complex is a unique development by today’s standards. Six concrete high rise towers occupy the 13-acre site with a total of 1222 freehold, strata condominiums. With nearly 1800 parking stalls, the complex offers one stall for each suite and generous, above ground guest parking. The grounds are extensively landscaped and maintained by a full time gardening staff. 24 hour, 7 day a week, onsite security gives residents peace of mind. Each tower has resident managers who work in conjunction with the onsite property management staff to ensure the complex runs smoothly for the residents. Extensive recreation facilities have always been a popular feature of the complex. There are 3 complete and separate facilities; each shared by 2 buildings. One of the benefits of construction to the old standards is relief from the tragedy of the “leaky condo” crisis. With a solid concrete building envelope, there are no stucco panels to leak and cause the massive damage seen in later construction. There is no history of building envelope failure due to design, engineering, poor workmanship or materials. Each building has a sizable contingency reserve fund and a continuous maintenance and upgrade program. More details on specific building updates can be found by clicking on the building links below. Disclaimer: This information is derived from sources that are believed to be correct at the time of writing but should not be relied upon by anyone without independent verification obtained from additional inquiries.